Many thoughts ran through my mind during a fateful visit to a Department of Veterans Affairs (VA) emergency room several years ago. One of them was not, “Is this doctor who’s treating me an independent contractor?” But this would turn out to be perhaps the most critical question, secondary only to what was causing the excruciating pain that brought me to the emergency room in the first place. In January 2016, my life changed in ways that I could never imagine. I endured grueling pain, bed-soaking night sweats and endless hours of lying on the cold bathroom floor desperately seeking any sort of relief. 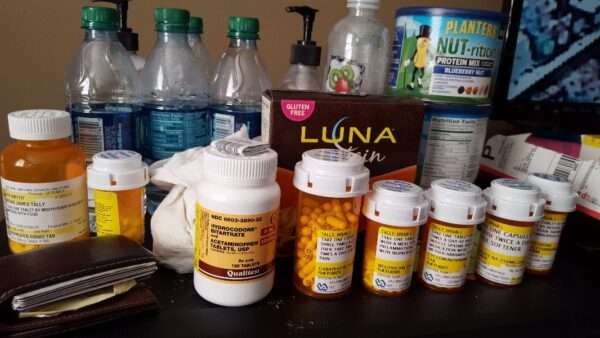 After multiple trips to the emergency room and an X-ray, I was injected with Dilaudid, Toradol and Kenalog, and was given a diagnosis of a “low back sprain” and sent home with a cocktail of pain pills. This would continue for four months until surgery was finally approved because my wife paid out of pocket for an MRI to prove to the VA that something was medically wrong inside my spine. 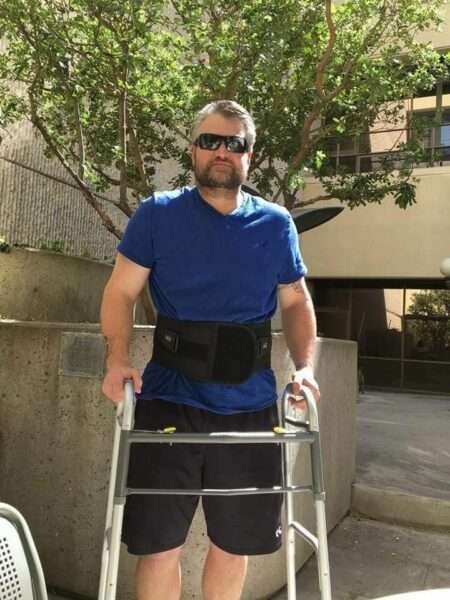 To the surgeon’s surprise, as I laid opened up on the operating table, he found the cause of my pain — a bone-eating staph infection that was aggressively attacking my spine and was destroying my spinal bone, tissue, disc and nerves. An infection that would’ve been detected much earlier had my first doctor ordered a simple blood test and an MRI. Once we realized that this untreated and very serious infection led to a host of other residual medical issues, my family and I decided to file a claim under the Federal Tort Claims Act (FTCA) for medical malpractice and gross negligence. Six months into the claims process, I began to receive calls from the VA’s General Counsel’s office. Each caller would repeatedly admit that the VA failed to meet the standard of care and someone was working on settling our claim. We were asked to be patient, as “this is a very long and tiring process.” They appeared very sincere and apologetic, and to show a great deal of compassion. These optimistic calls of certainty came at our most desperate times of need and continued on for months as we tried to stave off complete financial ruin. Nearly one year into the claims process, we received a letter stating that the VA was not responsible for the gross negligence. The reason given? The clinician who made the error was not a VA employee, rather an independent contractor working within the VA; thus the Federal Tort Claims Act did not apply. This meant my only recourse was to sue in state court for damages. The problem was the statute of limitations to sue in state court was one year — which had just expired when the VA general counsel conveniently revealed that a VA independent contractor was indeed at fault. This delayed notification of fault, combined with the FTCA exclusion of independent contractors, provides the agency with the perfect black hole through which medical malpractice claims disappear forever, no matter how egregious the wrong is or how badly it has ruined lives. Because of this horrific nightmare and the number of other veterans whom I was sure had already endured it, it was time to take action. As I began uncovering jaw-dropping information on how these cases were manipulated by VA attorneys, I embarked on a mission to change the very law that essentially ruined my life. I formed an online legislative team, and we drafted a bill called the “Brian Tally VA Medical Care and Liability Improvement Act,” or Tally Bill for short. This law, if passed, would protect all veterans who seek treatment in every VA hospital and clinic, regardless of the employment status of the clinician. It would effectively place the necessary safeguards that are needed to ensure veteran protection to include a clear path of legal recourse in a timely manner, and force the office of VA General Counsel to work in good faith with veterans who are victimized by medical errors. In September 2018, I took the Tally Bill to Washington D.C., walked the halls of Congress, going door to door to urge lawmakers to change this shameful and outdated law. Within 30 days, the bill had caught the attention of a Congressional Representative, who introduced the bill on the House floor; it received a bill number, H.R. 7105. 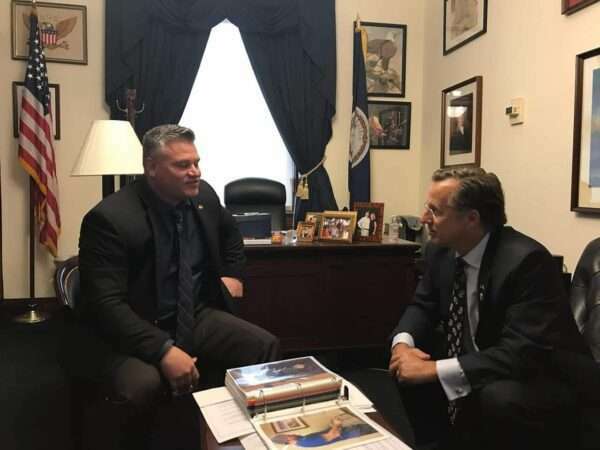 Brian Tally meeting with former Rep. Dave Brat. (Photo courtesy of Brian Tally). Like most bills, however, it would die during that session of Congress after the original bill sponsor failed to win re-election, which meant we would need to tirelessly pursue a new bill sponsor among the new faces in Congress. All hope is not lost. We will continue to fight for every veteran who is at risk until Congress amends Title 38 of the United States Code by passing H.R. 7105. All the bill needs is a champion in Congress to sponsor the legislation and advance the desire of thousands of citizens who have supported closing the 73-year-old legal loophole that has hurt, and still hurts, generations of veterans. VA hospitals can no longer be the place where accountability goes to die. We owe it to our veterans to fix this systemic problem once and for all. Please help save lives by calling, writing or visiting your Congressional representatives and urge them to support H.R. 7105 without delay. 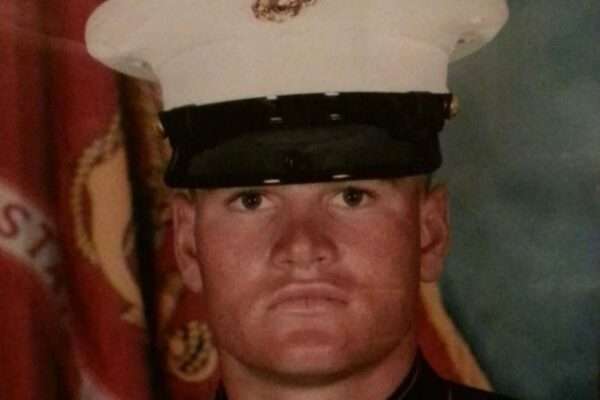 Brian Tally is a U.S. Marine Veteran. He is a former Sgt. in the United States Marine Corps. He was stationed in Camp Lejeune, in North Carolina, where he served with BTO Co. 2d FSSG; in Okinanwa, Japan, where he served with Landing Support Co. 3d FSSG; and Camp Pendleton, having served with base Hazmat/Compliance. He enlisted in 1994 and served active from 1995 to 1999. Brian has been married for 20 years and has four children.